This time last week I was in Brighton, at a fringe event for the Labour Party Conference. This week, it is Manchester for the same for the Conservatives. Not surprisingly, Mrs. Thatcher’s name was used and abused at both events, but I was intrigued by the Chancellor’s reference to her when announcing the sale of state-owned shares in Lloyds TSB. In the 1980s, the privatisations were characterised by a push to widen public share ownership – “Tell Sid” was the advertising campaign that accompanied them. There is no Sid today, nor even much of an aspiration to widen ownership – beyond pushing today’s bastardised grandchild of the right to buy (now in housing associations who have signed up, under pressure, to a voluntary deal, at the probable expense of tenants and the waiting list behind them in municipal council housing). So, what has actually happened in the three decades since 1985, when Mrs. Thatcher launched her push to widen ownership? The answer is in an essay I have co-written with a freelance researcher, Carina Millstone, as part of our core continuing 2015 communications theme of ownership. What makes coops different? Our ownership. What helps makes a difference in today’s business world? Sharing ownership. Unfinished Business: the ownership agenda thirty years on is the detailed essay published by the think tank ResPublica and I describe the some of the results on the Huffington Post online business site just up. The short answer is that, in relative terms, business ownership has narrowed. Family ownership is resilient and co-operative and mutual ownership is a star performer when it comes to spreading ownership. 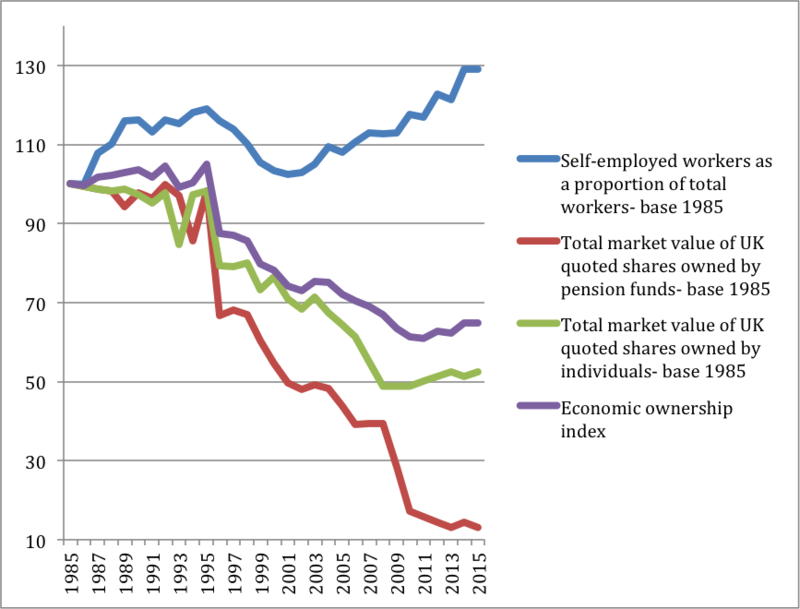 But individual share ownership has declined, while home ownership is at the same level it was in 1985. It has been fascinating to look at the poor quality of data over time on ownership. House prices and share prices rise and fall, prominent in the news, and with them rise and fall the hopes and fears of many. But when it comes to who owns what, and whether more people or less people do, there are far more assumptions than evidence in play. It ought to be a concern of some significance that, in relative terms, we are seeing a decline in ownership by the public, rather than its widening. Sid lost out and it is time to organise to change that before another generation passes.